Despite recent economic and political events and the resulting investor uncertainty nationwide, in Arizona at least there continues to be cause for optimism. According to George W. Hammond, Ph.D., Director and Research Professor at the University of Arizona’s Eller Economic and Business Research Center, Arizona’s economy is poised to exceed that of the rest of the nation over the next 30 years. While we are unlikely to see the growth rates experienced prior to the last Great Recession, and the impact of aging baby boomers continues to be felt on the national, state, and local level, economic gains and opportunities hold promise for Arizona investors (read the full article here). Arizona added 64,400 net new jobs in the second quarter of 2016 compared to the same period last year. Three sectors lost jobs over the year: mining and logging, government, and other services. Arizona’s educational attainment rate is declining compared to the rest of the nation. The long-run outlook for Arizona calls for continued growth in the major macroeconomic aggregates, like jobs, population, and income. -George W. Hammond, Ph.D.
Herein lies the opportunity. Arizona (Phoenix/Tucson) may have undiscovered business opportunities that go along with a changing demographic profile. 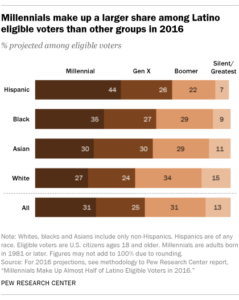 As baby boomer consumers shrink, other subgroups within the population segment expand including millennials, particularly the Hispanic subgroup. As this segment grows and exerts their influence, smart investors will capitalize on this emerging market.